Extract the contents to the Distant Worlds folder on your hard drive. It will ask you to replace 2 files, say yes if you want to convert Distant Worlds jumps to sound like the ships jumping in the reimagined BSG series. 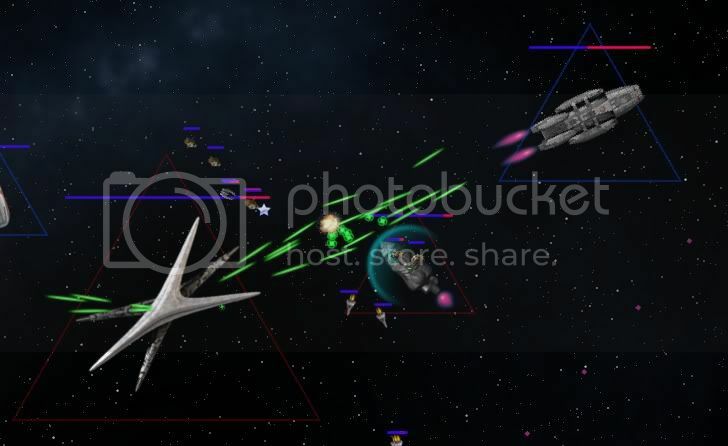 Battlestar Galactica has been updated for Legends. This will allow you to play an alternate story of the re imagining of Battlestar Galactica. "All this has happened before. All this will happen again"
Characters roles are based on their role in the show but have been born in to a Galaxy where the Battlestar Galactica fleet are not the only surviving humans. Included in this release are unique ship sets for Humans, Cylons and the Cylon Guardians, based on TOS as they appeared in Razor. Also included are many characters for both the Humans and the Cylons. All 3 new races are playable with their own victory conditions and unique feel. 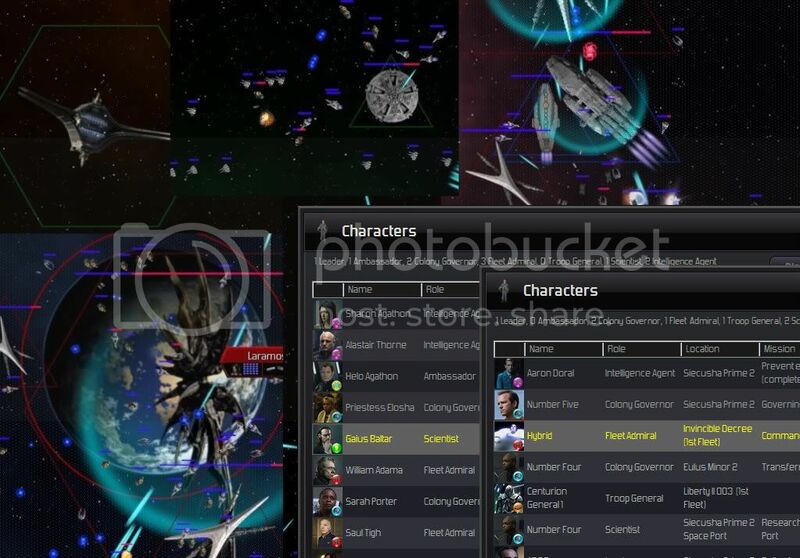 This mod requires Distant World Legends and at least version 1.7.0.2 update or higher. The following people have allowed me to include parts of their work in to this mod. Status: offline Thank you Haree :). The pics looks great . Are we still able to use original DW races with this mod? Status: offline Yes all races are included and they use their own ship sets. Yes all races are included and they use their own ship sets. Just wondering if the victory condition for humans is to reach a colonise a certain planet ;)? Status: offline Unfortunately I couldn't do that. It's possible I can in the future but right now I kept the objectives fairly similar to base game as we don't have the modding guide yet. Unfortunately I couldn't do that. It's possible I can in the future but right now I kept the objectives fairly similar to base game as we don't have the modding guide yet. Ahh I wasn't really serious. I mean you guys put so much work into these mods, we shouldn't really be demanding new stuff. Did you find that game is a big laggy with 1702 patch with your mod? Status: offline Yes I did, when I wacked the size of the Galaxy right up. Wasn't sure if it was the mod causing it or not. Status: offline I think it was the 1702 patch. Few other people are saying the same thing. Are you looking forward to the BSG movie? It will be based on the new series. Status: offline Do you mean the new series Blood and Chrome? I'm going to wait for the pilot. I'd hoped Caprica was going to scratch the BSG itch even though I didn't like the concept anyway. That was a huge let down though and felt like it lacked the character design BSG had, I couldn't even finish the series. I've not heard about an upcoming BSG movie? Status: offline Nope, I meant the movie. It's actually based on the original series, I was wrong about that. Status: offline Well I thought the original series was crap. The sort thing I would watch for fun when I was a kid but never actually turn the telly on for it, like Buck Rogers. Status: offline I love the new series, it's as realistic as sci-fi can be. Status: offline I'll probably check it out no doubt. I know Richard Hatch has been campaigning for this movie for years, like ever since they did that earth based BSG. I guess someone finally listened to him! I hope it is good though, not many Sci Fi movies these days are. Status: offline Damn, I downloaded the file but fore some reason it won't extract. Status: offline Hmm I'll check, should do. The one I have here does. Status: offline I have Zipitfree. When it extracts it just says 0 files extracted. I used Zipitfree with your previous mod with no problems (as well as Igard's ST mod). Status: offline There's nothing wrong with the rar file, I just downloaded and tested it. Status: offline Damn, I don't know what the problem is on my end then. Status: offline Got it extracted and just had a quick 5 min game. it looks great . I'll give it a whirl tommorow. What do you think, which other races should I include if I play a bigger map? Maybe another human empire (if it's possible to have original humans from DW- forgot to check)? Status: offline I like it on random. I actually replaced the original humans so you can't select them. Putting the Cylons on average distance with Young starting and Guardians on Young but distant works out to a nice game. Add in several random starting empires. I like it on random. I actually replaced the original humans so you can't select them. Is there a way to add original humans? That way I can have them in the game and I can ally with them vs Cylons :). Status: offline I could do it, the original race pic for humans would look out of place but might be able to find a suitable alternative. I'll look in to it when I find some time. I could do it, the original race pic for humans would look out of place but might be able to find a suitable alternative. I'll look in to it when I find some time. Don't worry about it, you must be busy. I jsut thought maybe I could copy all the race stuff from DW legends in BSG folder. I don't know much about modding so that might sound silly. Status: offline It's a lot more complex than that I'm afraid. Status: offline This is some really good work. The mod is well done! Status: offline Excellent work, Haree. This looks terrific. I've installed, and I'll try and squeeze in a wee game later on. The new series is pretty dark, as a show about a race being reduced to 40,000 people all fleeing death should be! Status: offline Way to go Haree! Looks great! Status: offline Many thanks, Haree! Love this mod and the music is the best.